Julian Edmund Tenison Woods was born in Southwark, England, on 15 November 1832. He was the fifth surviving child of James Dominick Woods and Henrietta Maria St Eloy Tenison. From his family Julian developed a great love of learning, of nature and of the outdoors. In 1855 at the age of 22, Julian arrived in Tasmania. Here he worked as a chaplain to the convicts and as a teacher. Leaving Hobart after three months, he travelled to Adelaide and there resumed his studies for the priesthood. 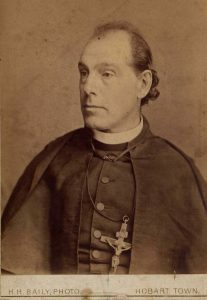 He was ordained by Bishop Francis Murphy on 04 January 1857. Fr Julian’s first parish Penola in South Australia, had an area of 57 000 square kilometres. In this vast landscape, the zealous young priest travelled on horseback to visit his parishioners, meeting many interesting persons en route. One was young Mary MacKillop. Their combined dream of Sisters to teach the poor and uneducated became a reality in 1866 with the founding of the Sisters of Saint Joseph. From 1867-1871 Fr Julian worked in Adelaide and during this time he was appointed by Bishop L Sheil as the first Director of Catholic Education in Australia. During the years 1874-1876 Fr Julian was a much loved missioner in Tasmania. It was during his first year on the island state that he founded the Sisters of Perpetual Adoration in Brisbane. From 1883-1886 Fr Julian worked as a scientist in Malaysia, Borneo, Hong Kong, Japan, on Royal Navy survey vessels and in the Northern Territory. His great love for science and the arts enabled him to enjoy, and benefit from, these years of relaxation and study. In May 1887, when his health began to seriously deteriorate, Fr Julian returned to Sydney. He was cared for by a group of women, led by Gertrude Abbot, at 561 Elizabeth Street, and it was here that Fr Julian died on 07 October 1889 at the age of 56. In 1888 Julian Edmund Tenison Woods was awarded the Clarke medal for ‘distinguished service to science’. This was a great achievement, but an even greater one was his founding of two religious congregations – the Sisters of Saint Joseph with Mary MacKillop, and the Sisters of Perpetual Adoration. Many people mourned the death of Julian the missioner, mystic, founder, scientist, journalist, explorer, and priest of God,1 especially Mary MacKillop, the Sisters of Saint Joseph and the Sisters of Perpetual Adoration.